What to do when a tooth is knocked out: Treatment by any person present, ideally a caregiver and injured person will work together to achieve an immediate (less than 5 minute) replantation — physically replacing the tooth into its socket. The proper way to remove debris from the root of an avulsed tooth is to rinse it in cold water (either tap or clean bottled water), being careful not to scrub or scrape it. If the root appears clean, grasp the crown between your thumb and first finger with the smooth flat surface forward. If it is an upper tooth place the other hand on top of the person's head to stabilize it then push firmly and hold the tooth in place. Sustained pressure is required to move blood that has accumulated in the socket. When the tooth is seated into its original position, it must be held there by hand or with a wad of wet tissue to keep it from extruding from the socket. 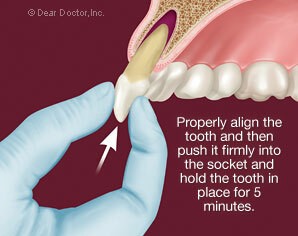 Do not worry about getting the tooth in ‘correctly’ it can be adjusted by the dentist later. Intraoral bleeding (from inside the mouth) or lip can usually be controlled by uninterrupted direct pressure for 5 minutes by any caregiver. If no one at the scene of the accident is prepared to replant the tooth, if the injured person is unwilling or unable to cooperate with immediate replantation, or if the damage to the tooth socket and adjacent teeth is substantial; control bleeding with pressure, place the tooth in either cold milk or the patient's own saliva to keep it from drying and transport the patient and tooth to a dentist. The removal of the dental pulp (the tissues in the central “root canal”) by a dentist within a few days, — this tissue once separated from the body, will die and cause infection, unless it is removed and the root canal disinfected and filled. The person's age at the time of injury — the teeth, roots and jawbones are at different stages of formation and maturity at different ages, both of which may affect treatment decisions. Beyond 5 minutes: Storage/transportation in cold milk or the patient's own saliva will prevent the avulsed tooth from drying but survival is determined by the factors just described, rather than choice of transport liquid. Any longer than this, a tooth essentially becomes a ‘graft’ (no longer recognized by the body as ‘self’) and affects the ability to regenerate periodontal ligament cells — the living cells on the root surfaces that connect them to the bone of the tooth socket. More than 15 minutes: The long-term outcome is less favorable. 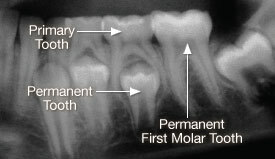 Further delay causes a fusion of the tooth to bone (ankylosis) followed by gradual root resorption (dissolving away) and tooth loss over a number of years. By or beyond twelve hours: Avulsed teeth replanted by or beyond 12 hours will last for a period of time for the reasons discussed above, but that is also dependent upon: the age of the person; removal of the pulp within 2 weeks and completion of endodontic (root canal) treatment. The tooth will survive for a period for time but ankylosis and/or resorption are inevitable. Decisions regarding replantation and treatment of injuries are based on these facts. Avulsed permanent teeth pose a unique challenge to caregivers. This is the only dental injury where immediate management affects long term outcomes. A survey of physical education teachers, school nurses, swimming pool attendants and parents of teenagers showed that 80 per cent would not want to replant an avulsed tooth, principally due to lack of knowledge and training. Immediate replantation can have positive lifelong consequences for tooth survival. Bottom line: Any permanent tooth that is avulsed (completely knocked out), should be replanted as soon as possible. Teeth replanted in pre-adolescents typically show shorter survival times than replantations in young adults because of the impact of the growth process and the enhanced cellular activity. These factors will influence the decision whether to replant a tooth or to remove a recently replanted tooth. An x-ray that illustrates the risk of how replanting a primary tooth could adversely affect the underlying permanent tooth. Treatment for a completely knocked out (avulsed) primary (baby) tooth: Primary teeth are managed differently from adult teeth and are generally not replanted. Replantation of primary teeth is not recommended by pediatric dentists. The major reasons for not replanting a primary tooth are concerns for the health and normal eruption of the underlying permanent tooth. Replanting primary teeth may cause infection to spread to the developing permanent tooth or interfere with the normal time sequence of the permanent tooth erupting into the mouth. The more important consideration is to retain space occupied by the lost primary molars, that act as guides for erupting permanent teeth. Therefore, more important than replantation, is to see your dentist or pediatric dentist to determine how to maintain the space the primary tooth occupied. This may prevent the need for orthodontic treatment to correct the situation later.